The first thing I learned upon arrival in Belize is their primary language is English. English? English south of the US border? I had always thought Spanish and Portuguese were the languages of choice in the Americas south of Texas. Even Southern Texans speak a mixture of English & Spanish called TexMex. Though most everyone speaking English made communication easier, I was disappointed. I don’t go to other lands for easy. I go for adventure. A challenge. Agitation. Arousal. Nad kicking experiences. I was looking forward to cultural immersion knowing it would force me to practice my rudimentary Spanish, move it beyond the babbling that would make a native speaking 2 or 3 year old sound eloquent. Perhaps achieve 4 year old status. Visit enough countries in Central and South American and I may even learn to Hablo Español as well as a homegrown 1st grader. I am sure the language preference along with the climate are the reasons most visitors we met were from either Canada or the United States. There are two ways to get to our target island from the airport. One a short hop plane ride the other a ferry. Hoping to experience wide ocean vistas, and a smooth transition from city thinking to island thinking, we chose the ferry. Unfortunately, we were unable to get a seat in the upper section and were herded into the main, lower section. The windows were above our heads so we needed to stand for any vistas. I was disappointed. 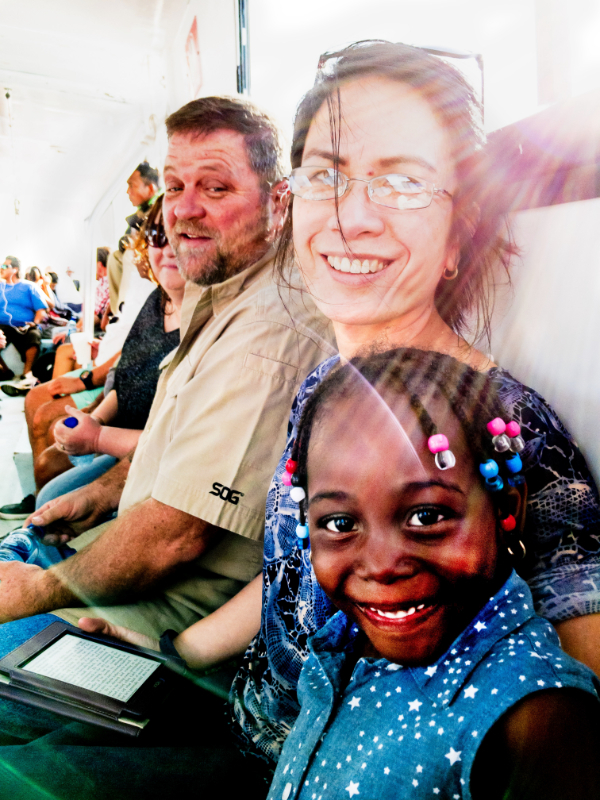 The boat was crowded and uncomfortable, a cattle car of people and luggage. However, we did have some interesting interactions with passengers. There was a little girl who made her way around the boat meeting people, sitting with them, asking them their names, asking them to take pictures of her. She eventually made it to our end and spent 10 minutes talking to us. I forget her name but not the smiles she brought to the faces of the passengers, all her new friends. We met a rugby player still tipsy after his post-match celebrations. We met a retired soldier from the US Army struggling with a boot cast. Just past the 1/2 way point to our island, we stopped to offload some passengers at Caye Caulker and island described by one of our guides as a drinking island with a fishing problem. From what I could tell, the main sport on both Caye Caulker and Sand Pedro, the island we were destined for, was drinking. Thankfully, our resort, Cocotal Inn & Cabanas, was a small, quiet place with an ocean view and a covered porch. It suited us perfectly. 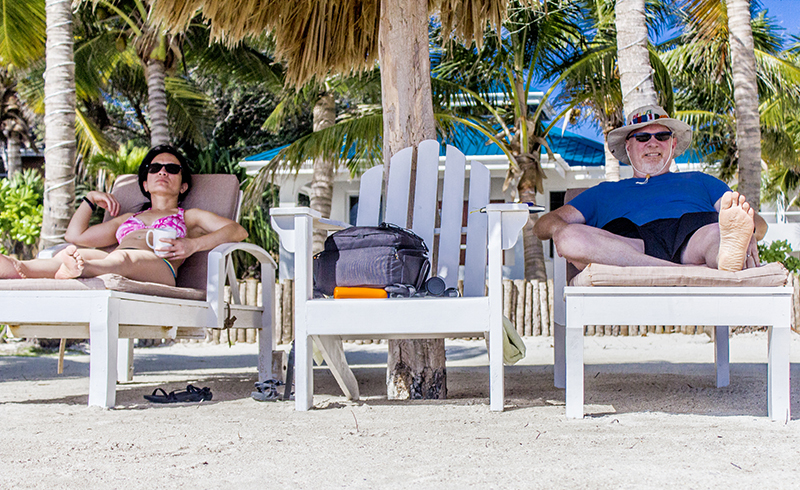 We couldn’t have asked for a more perfect setting for the first half of our Belizean adventure. It was so perfect for us, my wife, who never wants to go the same place twice, is already planning on returning there next year. This time for an entire relaxing week in the ocean front cabana. I’m all in, too. Beside the front door opening to the ocean, the inside was beautiful. One big room finished in glossy, dark brown teak. Including the slatted, geometric ceiling. It was a short walk to restaurants and bars. It includes a kitchen so next year we will be buying food at the local stores and doing some of our own cooking. The hosts were gracious and friendly taking care of our every need without hesitation. We were hoping to visit Tikal in Guatemala on the second leg of our Belize adventure but that tour required at last four people and, so far, we were the only two requesting the trip. So, we chose to visit the lesser known in Lamanai in the event Tikal fell through. 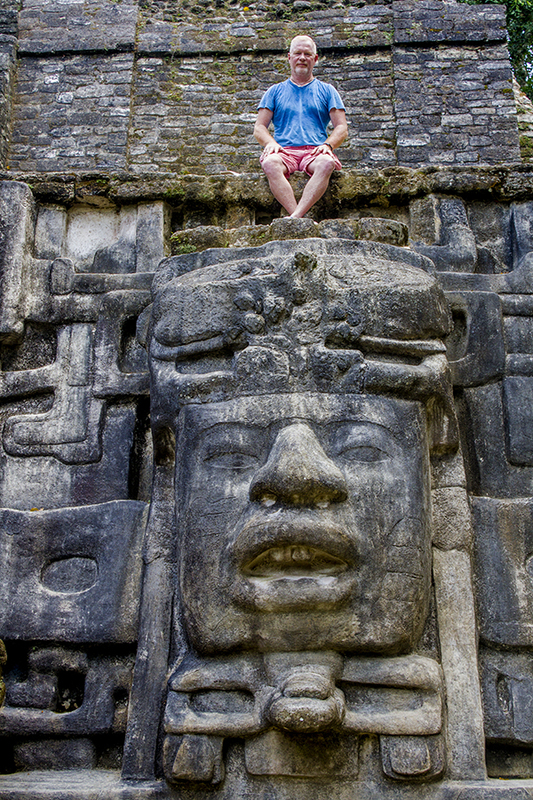 I was not willing to save a few bucks and risk missing out on a Mayan temple adventure. I love visiting ancient ruins and ancient buildings. I walked in the footsteps of the Romans at Volubilis in Morocco. I meditated where the Buddha meditated at the foot of the Bodhi Tree at Bodh Gaya in Bihar, India. I sat and listened to the winds where Paul the Apostle preached in Ephesus. I fantasized about choosing my nightly liaison from the Sultan’s harems at the Topkapi Palace in Turkey. I loved wandering the 2,500 year old halls of the magnificent Meenakshi Amman Temple in Madurai India where millions of devotees have prostrated before their gods seeking blessings. And I want to visit the ancient temples in the Americas that housed the Incas, the Mayans, the Aztec. The Mayan dream would come true in Belize and Guatemala. And, to my surprise, the Aztec dream materialized a couple of months later. We signed up at for an adventure at our resort and magically, at the appointed time, a service comes to the dock and picks us up. The trip to Lamanai was no arduous. Three hours each way. Three one hour legs. Leg one was a very bumpy ride on a choppy ocean that left our keister painfully numb. Leg two was on a school bus designed for small children. I had to sit sideways to avoid knee pain. The final leg was again on a boat, this time through narrow rivers where we were able to encounter some wildlife including a monkey we fed fruits and photographed. When we finally arrived, the guides fed us our lunch. Local foods with excellent flavor and more than enough to fill our bellies. Finally, we purchased our park permits and the group headed out with the guide for the tour. Guides are double edged sword. On the one hand, a good guide will add to the experience with deep knowledge and rich stories. But, on the back swing, the time allotted for lingering, for smelling the mustiness of the ancient structures, for deep exploring is minimal. We are a group. We must keep time. Ideally, the first part would be a tour with a guide providing local color and the next six parts would be time to meander the hallowed halls. We were at Lamanai for between 1 and 2 hours. I could have spent that much time exploring the first temple, the Jaguar temple. I wanted to climb it. Step in the footsteps of the long dead and try to imagine the ancients living life. I wanted to lay on the top level of the pyramid with my eyes closed and try to feel the spirits of long dead Mayans wandering over the land still trying to get to their version of heaven. We were able to climb other pyramids later in the tour but there was not enough lingering time to suit me. The highlight of the tour for me was, by far, the temple of the big heads decorating the last temple we visited. At both sides of the pyramid adjacent to and seemingly guarding the steps were two massive head carvings. The one on the right was in startling magnificent condition for such an ancient creation especially considering the harsh jungle living conditions. It could have been the image of a king. It was too perfect to be a demon or an underworld dweller. In my imagination, it was a guardian, a protector of the king at the top of the temple surveying his kingdom and looking over his subjects. Or the priests looking for a blood sacrifice to appease the gods, a sacrifice that would ensure the sacrificed would dwell immediately in heaven without the need to battle up through the layers of the underworld. I imagine the head houses a soul, an ancient soul charged with forever protecting the spirits of the ancient Maya, waiting for the day they will return to reclaim their lands. I imagine it becoming animated when blood sacrifices return helping the Maya regain the power lost long, long ago. I wanted to spend hours staring into the eyes of the statue trying to understand what they saw, feel what the felt, understand what they know. I would have spent more hours making up little stories, vignettes trying to put myself in the mindset of those that disappeared or were assimilated in the days gone by. The return trip was a reverse, still the three long hours and, on the way, we were drenched on the ocean leg in a downpour. The rain combined with the speed of the boat hit like stinging nettles and soaked through our clothing. We were the second to last couple to be dropped off and were glad to be back at our Cabana where hot showers were the first order of business. For all the challenges of the travel, I loved visiting Lamanai. I loved seeing the magnificent pyramids build by ancient hands without the aid of machinery or computers. I just wish I had a few days to linger in their presence. Literally, I swam with sharks. It’s not a metaphor for hanging with dangerous people. I snorkeled with sharks. They were nonaggressive nurse sharks so it was more like floating with a pod of puppies, however, for a person raised on the movie Jaws, it was spine tingling especially when I look down and see a large shark had snuck up from behind me and was silently swimming directly below me on it’s way to the feeding frenzy. The big tail rocked from side to side pushing it through the water. Had they been man-eaters, I would have been little more than chum. When we snorkeled in the shallows of the Philippines, there were myriad colorful and dainty fish hovering around the bread we brought to feed them. I didn’t get to photograph any of the painted sprites and vowed it would never happen again. So, I bought a GoPro especially for Belize. The 2nd largest barrier reef in the world is accessible from the island. I captured memories of the beautiful fish and impressive sharks in both the still frame of photos and in the gliding videos. The program enables me to grab a single frame and save it as a photo for inclusion in my blogs. This entry was posted in Americas, Belize, Exploration, Explore, Travel and tagged Lamanai, Ocean, Shark, Snorkeling. Bookmark the permalink.